Today, the biggest part of the lawyers is specialized in different fields. 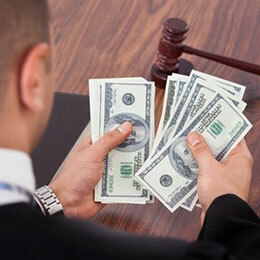 Thus, according to the traffic generated around them, they do not have the same amount of clients, and depending on the cases’ complexity, the lawyer fee differs. Business lawyers : Lawyers who are specialized in business and defending big companies are those who take the smallest number of cases, but who have, also, the highest wages. They can win more than 5 000 € per month. Labor lawyers : Lawyers who are specialized in labor and litigations that occur during work have a big responsibility defending their clients. An employer may go bankrupt after improperly firing a big number of employees, while an employee may be jobless, with no cash to pay his rent. It is the lawyer’s job to defend his client at all cost. Their salary is usually around 4 000 €. Family law attorneys : A lawyer who is specialized in family issues, especially in cases of divorces, must be particularly attentive. They must help their client get the most out of the conflict. Even if, when it comes to monetary issues, the two parts may come to an agreement, it is when it concerns the children that the conflict may get harsh and complicated. It is also known that the procedure usually takes much time. They win monthly around 3 000 €. It is hard to define the lawyers’ average salaries, especially if we consider that women gain a bit less. So, the best way is to classify them by gender, too. A lawyer’s average salary (men) : around 4 500 € / Month. A lawyer’s average salary (women) : around 3 500 € / Month. It is often wise to resort to a lawyer well before the given conflict worsens. You have to know that a good lawyer is not one that will impress you with a completely unusual speech or answer evryone of your questions here and now. On the contrary, it's better to choose your lawyer according to his ability to speak to you in plain language. Not all lawyers are the same, and their fees depend on their specialty and affinities. At any rate, all lawyers defend their clients’ interests in different cases. To every type of cases, there are some qualifications that are required if the lawyer wants to be successful. So, obviously, in family matters cases, a Family Law Attorney is required, while for contract termination issues, a Labor Lawyer is mandatory. Each category of lawyers has an average salary that we will see here.